Analysis: It's unclear which of the tenders (first-, second- or original-round) was given to Higgins, but the Browns will have the right to match any offer that he receives as a restricted free agent. 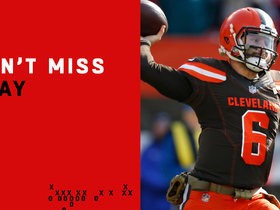 He fared well working with Baker Mayfield for most of the 2018 season, when he gathered in 39 of his 53 targets for 572 yards and four touchdowns. Such production should help Higgins cultivate interest on the open market. Analysis: While Dorsey didn't say which level of tender he will place upon Higgins, the point is that Higgins isn't going anywhere in 2019. The wideout should remain the team's fourth receiving option behind Jarvis Landry, Antonio Callaway and tight end David Njoku. Analysis: Higgins put together the best season of his young career in 2018, posting career bests in receptions, yards and touchdowns despite sitting out three games. He finished fifth on the team with 39 receptions and is set to become a restricted free agent this offseason. The Browns will want to place as many offensive weapons around Baker Mayfield as possible, so it will be interesting to see what the team does with Higgins in terms of tendering him. Higgins caught six of seven targets for 60 yards and a touchdown during Sunday's 26-18 win over the Bengals. Analysis: Higgins extended Cleveland's lead to three scores late in the third quarter when he took a pass over the middle and stiff-armed his way to a 17-yard touchdown. The game marked a season high for catches for Higgins, who had topped 30 yards in a game just once in his previous six games. He has been relatively effective as a scoring target, with four touchdowns in his last eight games. The season concludes next Sunday against a top five Ravens pass defense. Higgins recorded two catches on three targets for 30 yards during Sunday's 17-16 win over the Broncos. Analysis: Higgins surpassed his career high in catches in the second quarter when he came down with a pass from Baker Mayfield. The third-year wideout has a reception in every game he's played in this season and has turned into a reliable depth option for the Browns. Higgins caught two of three targets for 19 yards during Sunday's 26-20 win over the Panthers. He also lost a fumble. Analysis: Higgins played exactly half of Cleveland's offensive snaps, though his involvement remained limited. His longest catch of the day went for a 15-yard gain when Baker Mayfield found him open in the second quarter. Higgins has three touchdowns over his last six games, though Saturday's game against the Broncos will prove a tough matchup for the third-year wideout. Higgins caught each of his four targets for 62 yards and a touchdown in Sunday's 29-13 loss to the Texans. Analysis: Higgins played 33 of 57 snaps (58 percent) on offense, essentially splitting the No. 3 receiver role with Breshad Perriman, who caught two of six targets for 26 yards across 26 snaps (46 percent). 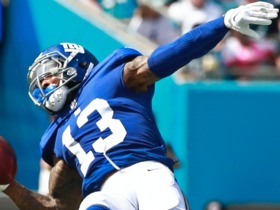 Neither player poses much of a threat to Jarvis Landry or Antonio Callaway heading into a favorable Week 14 matchup with the downtrodden Carolina defense. Higgins caught one of three targets for 24 yards during Sunday's 35-20 win over the Bengals. Analysis: Higgins played just 20 offensive snaps Sunday, as Breshad Perriman seems to have jumped over him on the depth chart. The third-year wideout from Colorado State has been productive when he healthy, though he has just two catches over the past three weeks due to his decrease in playing time. Higgins caught a 28-yard touchdown pass with his lone target during Sunday's 28-16 win over Atlanta. Higgins played 29 of 75 offensive snaps (39 percent) and caught three of four targets for 19 yards during Sunday's 37-21 loss to the Chiefs. 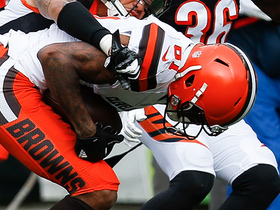 Analysis: Higgins made his return after a three-game absence with an MCL sprain, though it appears the Browns were careful about overworking him during his first game back. Antonio Callaway acted as Cleveland's No. 2 receiver, though that could change if new head coach Gregg Williams and offensive coordinator Freddie Kitchens favor the veteran over the rookie. In six games, Higgins has 19 receptions for 263 yards and a touchdown. Higgins (knee) is listed as active for Sunday's game against the Chiefs. Analysis: Higgins is out there if you need him in his return from a three-game absence, but he's a speculative fantasy play until he re-proves his health. In the coming weeks though, there's an opportunity for him claim a key role in the Cleveland offense behind top option Jarvis Landry, given Callaway's sporadic production to date. Higgins (knee) is listed as questionable for Sunday's game against the Chiefs, but the Browns believe he'll be able to play, Ian Rapoport of NFL Network reports. Higgins (knee) is listed as questionable for Sunday's game against the Chiefs, Nate Ulrich of the Akron Beacon Journal reports. Higgins (knee) suited up for Friday's practice, Scott Petrak of the Elyria Chronicle-Telegram reports. Analysis: Higgins was unable to practice Wednesday, but it looks like he'll get some work in for the second day in a row, giving him a chance to return to action this weekend after sitting out the last three games. He could play a key role if he is able to play Sunday, as fellow wideout Antonio Callaway could be either limited or sidelined due to an ankle injury he picked up at Thursday's practice. Higgins (knee) was listed as a limited practice participant Thursday. Analysis: Higgins is thus trending in the right direction after missing Wednesday's session. While his progress is encouraging, he's still in the day-to-day category and not a lock to play Sunday against the Chiefs, per Nate Ulrich of the Akron Beacon Journal. Added clarity on the Week 9 status of Higgins, as well that of Antonio Callaway (ankle) will arrive upon the release of Friday's final injury report. Higgins (knee) was on the field Thursday for the start of the Browns' practice, Scott Petrak of the Elyria Chronicle-Telegram reports. Higgins (knee) didn't practice Wednesday, Nate Ulrich of the Akron Beacon Journal reports. Analysis: Higgins' ongoing absence from practice thus continues to cloud his status as Sunday's game against the Chiefs approaches. If he remains out for a fourth consecutive contests, added snaps would be available for depth wideouts Damion Ratley and Breshad Perriman. Higgins (knee) has been ruled out for Sunday's game against the Steelers, Nate Ulrich of the Akron Beacon Journal report. 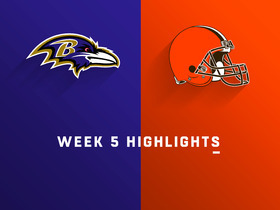 Analysis: With Higgins slated to miss his third consecutive game, Damion Ratley figures to continue to see added work Sunday along with starters Jarvis Landry and Antonio Callaway, while newcomer Breshad Perriman is also a candidate for added snaps in Week 8. Higgins (knee) isn't participating in Thursday's practice, Nate Ulrich of the Akron Beacon Journal reports. Analysis: Coach Hue Jackson admitted that it was unlikely Higgins would suit up Sunday against the Steelers, making the wideout's lack of on-field work Thursday unsurprising. With Higgins on track to miss a third consecutive game, Damion Ratley looks like the top candidate to pick up most of the snaps alongside starters Jarvis Landry and Antonio Callaway in three-receiver sets. Higgins (knee) didn't participate in practice Wednesday, Mary Kay Cabot of The Cleveland Plain Dealer reports. Analysis: Moreover, Andrew Gribble of the Browns' official site relays that coach Hue Jackson doesn't expect Higgins to play against the Steelers on Sunday. If that's the case, added opportunities behind top wideout Jarvis Landry would be available for Damion Ratley, Antonio Callaway and perhaps even Breshad Perriman. Higgins (knee) has been ruled out for Sunday's game against the Buccaneers, Nate Ulrich of the Akron Beacon Journal reports. 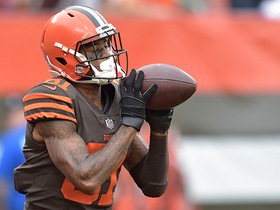 Analysis: With Higgins out, the Browns' Week 7 wideout corps will be headed by Jarvis Landry, Antonio Callaway and Damion Ratley. Meanwhile, Breshad Perriman could carve out a role in the team's offense as injuries and personnel changes continue to alter the makeup of the team's receiving depth chart. Higgins (knee) isn't practicing Wednesday, Mary Kay Cabot of The Cleveland Plain Dealer reports. Higgins (knee) said he would play in Sunday's game against the Chargers if it were up to him, Nate Ulrich of the Akron Beacon Journal reports. Higgins (knee) is expected to miss at least two games, Mary Kay Cabot of The Cleveland Plain Dealer reports. Higgins (knee) is considered week-to-week with a sprained MCL, Mary Kay Cabot of Cleveland.com reports. Higgins was forced out of Sunday's game against the Ravens with a knee injury. Analysis: Prior to his exit, Higgins hauled in three of his four targets for 66 yards and a TD. Antonio Callaway is a candidate to see added looks as Sunday's game winds down. Looking ahead, if Higgins misses time, Rishard Matthews (who is visiting the Browns on Monday) could be a candidate to join Cleveland's wideout mix in advance of Week 6. Higgins secured four of five targets for a team-high 61 yards during Sunday's 45-42 loss to Oakland. 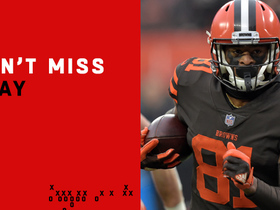 Analysis: Though Higgins led the Browns in receiving yards, his five targets failed in comparison, as Jarvis Landry, Antonio Callaway, David Njoku and Duke Johnson were all targeted more by Baker Mayfield. The third-year wideout was on the field for 65 percent of the Browns' offensive snaps and is expected to have a similar workload going forward. Higgins caught all three of his targets for 32 yards during Thursday's 21-17 win over the Jets. Analysis: Higgins was on the field for 54 of the team's 77 offensive snaps (70 percent), but wasn't really involved in the offense until Baker Mayfield took over. The two connected on three passes in the second half, including a deep pass that went for 19 yards. Higgins is clearly behind Jarvis Landry and rookie Antonio Callaway on the depth chart, though Mayfield's expected presence under center from here on out adds to Higgins' value. Higgins caught five of seven targets for 47 yards during Sunday's 21-18 loss to the Saints. Higgins hauled in one pass (four targets) for 38 yards during Sunday's 21-21 draw with the Steelers. Analysis: Higgins was on the field for 61 percent of Cleveland's offensive snaps, making him the clear No. 3 receiver behind Jarvis Landry and Josh Gordon and ahead of rookie Antonio Callaway. The third-year wideout caught only one pass, but it went for 38 yards after Higgins beat his defender on a go-route. With Landry and Gordon expected to dominate the target share, it'll be interesting to see how involved Higgins remains going forward. Higgins brought in both of his targets for 27 yards in Thursday's 5-0 preseason win over the Eagles. Analysis: Higgins -- who's battling for a roster spot -- has made a strong impression thus far in the preseason. Through three games, the 23-year-old has eight catches for 113 yards, including four receptions for 66 yards during the exhibition opener. Rookie wideout Antonio Callaway (groin) currently has the leg up for the third receiver spot, but Higgins has a relatively good shot at making the team in a depth role. Higgins opened the preseason with four catches for 66 yards on five targets in Thursday's 20-10 win over the Giants. Higgins, who caught three of four targets for 68 yards and two touchdowns during Sunday's 28-24 loss to the Steelers, ends 2017 with 27 receptions for 312 yards and two scores. Analysis: Higgins began the year on the practice squad but was soon promoted after Corey Coleman was shelved with a hand injury. He finished tied for fourth on the team in receptions and should be considered for a roster spot in 2018, depending on what the Browns do in the draft and free agency. 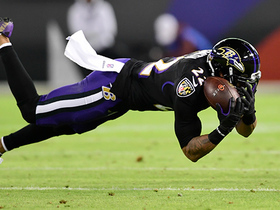 Higgins caught both of his targets for 10 yards during Sunday's 27-10 loss to Baltimore. Analysis: Higgins saw more snaps (52 of 64) than Corey Coleman, though he was unable to establish a connection with DeShone Kizer. The former second-round pick --- who began the season on the practice squad -- has 22 receptions for 224 yards but just two catches in his last three contests, despite the increase in snaps. Higgins was on the field for 57 percent of the team's offensive snaps but wasn't targeted during Sunday's 19-10 loss to the Chargers. Analysis: Higgins has officially supplanted Ricardo Louis on the depth chart, as he once again played a plethora of more snaps Sunday. Still, despite playing over 50 percent of the plays on offense, DeShone Kizer never looked his way. Most of Kizer's targets were directed toward Josh Gordon, and it may be tough sledding for Higgins going forward. Analysis: For the second consecutive week, Higgins out-snapped Ricardo Louis, though his newfound involvement in the offense may be short-lived, as Josh Gordon is expected to make his much-awaited debut Sunday against the Chargers. Still, Higgins' 30 receiving yards was his third-highest total of the season, and it seems he has leapfrogged Louis on the depth chart. Higgins finished without a catch (two targets) during Sunday's 19-7 loss to Jacksonville. 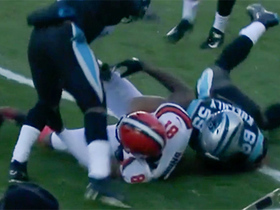 Analysis: Higgins went without a catch for the first time this season, as No. 1 wideout Corey Coleman made his return to the field. Interestingly enough, despite Higgins' lack of production, he saw more action than Ricardo Louis, finishing with five more offensive snaps. It remains to be seen if that trend will continue, but it's definitely something to keep an eye on. Higgins grabbed all four of his targets for 34 yards during Sunday's 38-24 loss to Detroit. Analysis: Though Higgins played just barely over half of the team's offensive snaps, he still managed to post his highest reception total since his first game of the season on Sept. 17. He was aided by DeShone Kizer's (ribs) improved accuracy and has the opportunity to be more involved with better quarterback play. Don't expect much against the Jaguars on Sunday, though, as cornerbacks A.J. Bouye and Jalen Ramsey are two of the best in the game. 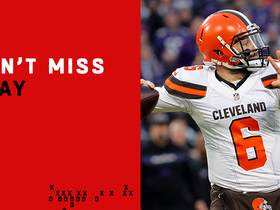 NFL Network's GameDay Highlights breakdown the completely probability for Baker Mayfield's 28-yard touchdown throw to Rashard Higgins. Cleveland Browns rookie quarterback Baker Mayfield uncorks a huge 28-yard touchdown on the run. 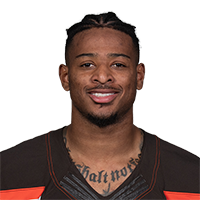 Cleveland Browns quarterback Baker Mayfield finds wide receiver Rashard Higgins for a 26-yard gain.